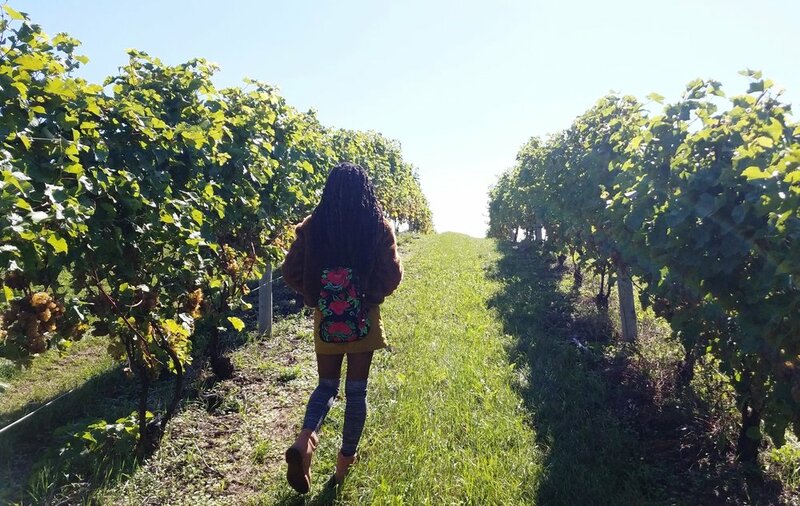 In and around the state of Michigan, it’s no secret that some of the best wineries and vineyards can be found along the stretch of highway M-37 that runs all the way to the top of Traverse City’s Old Mission Peninsula. Splitting Grand Traverse Bay into its east and west arms — a geographic configuration that always makes me think of The Great Gatsby’s East Egg and West Egg (even though the roles of water and land are reversed) — Old Mission Peninsula has got to be one of the most scenic destinations in the entire Lower Peninsula, and its numerous vineyards only add to its charm. There are 11 wineries on the peninsula, some of which have their own vineyards, as well. The difference in the two terms is not merely a semantic one — a winery, by definition, is either a business that derives its revenue from the production of wine or the establishment where grapes are transformed into wine, while a vineyard is a farm where grapes are grown, oftentimes to be used for wine making but also as a source of table grapes and raisins. The three establishments I list below are all wineries that have their own vineyards, meaning they oversee the production of their wines from grape growing all the way to the glass — and I think that’s just the way it should be. What better way to run your operation than to make sure every detail in every step of the process is being handled with care? That’s a standard we should expect from every business producing consumer goods, but it’s not the only reason I am suggesting you visit these three wineries on and around Old Mission. Designed to resemble wineries you would find in the grape-growing regions of Europe, the winery at Mari Vineyards, with its stone masonry and red-tiled roof, immediately gives off Italian vibes, which is just what owner Marty Lagina was going for when he oversaw the planting of Mari’s first vineyard in 1999. With their dedication to growing exotic grape varieties such as Nebbiolo and Sangiovese — both of which originated in Italy — Mari Vineyards is perhaps one of the most unique wineries on Old Mission Peninsula. If nothing else, it is at least the most Italian, and who knows their wines better than those guys and gals? Though Black Star Farms has a smaller tasting room located on Old Mission, their real operation is up in Suttons Bay on the Leelanau Peninsula, another fine strip of land adjacent to the west arm of Grand Traverse Bay that stretches out into Lake Michigan. Celebrating their 20th anniversary this year, Black Star Farms, aside from their award-winning wines and spirits, is probably best known for their palatial red estate house offering luxurious guest rooms and sweeping views of the surrounding landscape. Whether you visit the motherboard in Suttons Bay or the tasting room on Old Mission, you can’t go wrong with their wide selection of fine wines. One of the last wineries you’ll come across on your drive up Old Mission Peninsula, Chateau Chantal, offering some of the best panoramic views of the east arm of Grand Traverse Bay, encompasses a 65-acre estate that combines vineyards, a winery, a bed & breakfast, and winding roads as one of the finest destinations in all of Northern Michigan’s wine country. With a specific focus on Michigan wines, Chateau Chantal is known for its Riesling, Chardonnay, Pinot Grigio, Pinot Noir, and Cabernet Franc, among other local varieties. Perhaps as intriguing as the chateau itself is the story of its owners, Robert and Nadine Begin, who were both religiously involved in a past life — he as a Catholic priest for 12 years, she as a former Felician Sister — before purchasing property on Old Mission and building up the winery that exists today. One trip there and you’ll be glad they decided to pursue a different path all those years ago.